(TibetanReview.net, Dec30, 2017) – China’s state media globaltimes.cn said Dec 26 that the Doklam standoff of Jun-Aug 2017 had pushed it and India to the brink of war, becoming the biggest crisis between them in the past 55 years. And Chinese authorities on Dec 28 called for better military relations with India in 2018, urging the latter to manage its border troops in a “proper way”, reported the country party mouthpiece People’s Daily Dec 29. 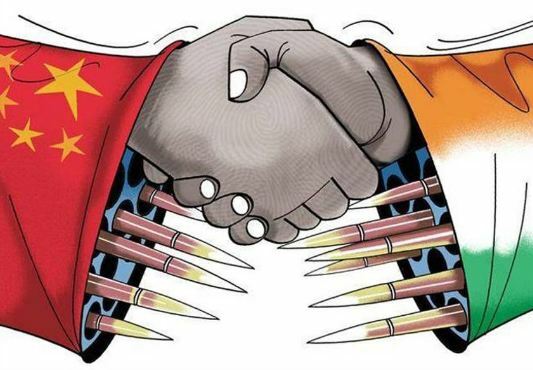 The globlatimes.cn commentary said bilateral ties had been blighted by three major strategic contradictions: the border dispute, the Tibet issue, and India’s reckoning that China-Pakistan friendship posed a threat. It added that these three interwoven conundrums were not likely to be solved in the near future; that control and management were therefore the only way out. The commentary also said India has been very negative about China’s Belt and Road initiative while being indifferent to the Bangladesh-China-India-Myanmar Economic Corridor which therefore remained in a limbo. On the border issue, the People’s Daily report cited Senior Colonel Ren Guoqiang, spokesperson for the Ministry of National Defense (MND) of China, as saying at a regular press conference on Dec 28 that the two countries’ military relationship was a crucial component for bilateral ties. “It is important for the two nations’ military authorities to strengthen strategic communication, in an effort to maintain peace and stability along the China-Indian border,” he was quoted as saying. Ren’s remarks were noted as having come after senior officials from both sides agreed to properly handle border issues at the 20th round of talks between Chinese and Indian special representatives on boundary issues on Dec 23. It noted that Chinese State Councilor Yang Jiechi and Indian National Security Adviser Ajit Doval had decided to focus on talks between the two nations, maintaining contacts and negotiation, as well as boosting strategic dialogue and communication in a bid to create favorable conditions for the development of China-India relations. The globaltimes.cn commentary referred to positive aspects in bilateral relations as well. It noted that one week after the Doklam episode ended, Indian Prime Minister Narendra Modi attended the BRICS summit in China’s resort city of Xiamen. Noting that China was already at the center of international political power, it said India needed the BRICS more. It also said that in December, foreign ministers meeting of Russia, China and India in New Delhi showed that despite bilateral conflicts, Beijing and New Delhi had wide-ranging common interests on regional and global affairs, and multilateral mechanisms were still important platforms for the two to launch pragmatic cooperation. While calling 2017 the worst year for China-India relations, the commentary added that the two countries had huge potential of cooperation.